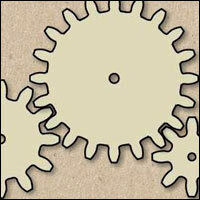 Latest in my long line of things to use instead of Flash, I present, Three Gears Animated with JQuery. This is actually a flick book style animation with a single image, shown left, made up off six frames that I created in Flash. Each frame is pasted into place on the page in quick rotation. The result is a pretty reasonable animation. Does it work for you? It is still not as good as Flash. The file size is over four times the size of the Flash equivalent and whilst adding more frames to a flash animation has a negligible effect, adding frames to this type of animation quickly bloats the files. Why do you hate Flash Steve? Why! I don't hate Flash. But you do have to do something about the animation on this page. It appears that there is a problem with the position and the loop point. Thanks. Which browser / OS is it not working in? Sorry to bore you but… Once upon a time there were a bunch of software guys who worked for Apple computers (i.e. for Steve Jobs) who created the likes of Pagemaker, postscript (fonts) etc. When they asked for a pay rise/recognition and it wasn't forth coming they in typical silicon valley tradition, up sticks and set up on their own, and Adobe was born along with PhotoShop, Illsustrator and Flash. Steve Jobs taking a dislike to the upstarts (but realised that he needed PhotoShop & Illsustrator) put a block on Flash as a public sulk, hence his stand on HTML4 standards. Ah – that explains that then. Here's Steve's version of the three gear animation using an animated gif. Only 28k! No, not that Steve, the other one.